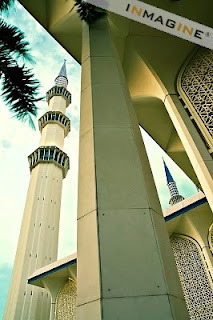 The Sultan Salahuddin Abdul Aziz Shah Mosque (Malay: Masjid Sultan Salahuddin Abdul Aziz) is the state mosque of Selangor, Malaysia. It is located in Shah Alam. It is the country's biggest mosque and also the second biggest mosque in Southeast Asia after Masjid Islamic Center Samarinda, Indonesia. 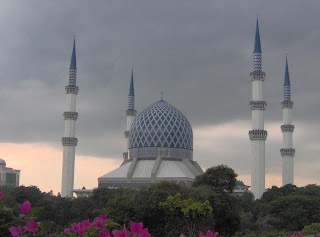 The mosque was commissioned by the late Sultan Salahuddin Abdul Aziz, when he declared Shah Alam as the new capital of Selangor on February 14, 1974. Construction began in 1982 and finished on March 11, 1988. 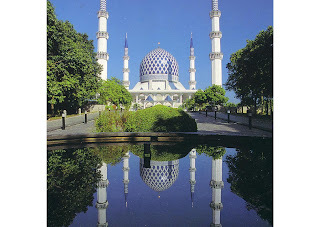 During the reign of Sultan Salahuddin Abdul Aziz, Shah Alam Mosque was built between 1982 and 1988. The Mosque is also known as the Blue Mosque owing to its blue dome which is one of the largest in the whole world. The structure of the mosque incorporates Malay and Islamic architecture. Its architecture is a combination of Malay and Modernist style. 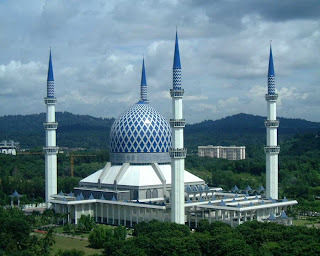 It is nicknamed as 'Blue Mosque' for its blue aluminium dome covered in a rosette of verses from the Qur'an. At the hallway (first floor) of the mosque. The main dome of the mosque is one of the biggest domes in the world, measuring 170 feet in diameter and 350 feet in height from the ground level. The four minarets are the second tallest in the world at 460 feet. In its early years, the mosque was also listed in the Guinness World Records as having the tallest minaret in the world , a title it had lost to the King Hassan II Mosque in Casablanca. The mosque is large enough that on clear day it can be seen from certain vantage points in Kuala Lumpur. The mosque can accommodate up to 16,000 worshippers. 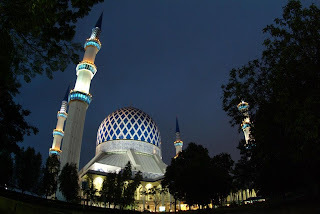 Location Shah Alam-Malaysia, Religious affiliation Islam, Region Peninsular Malaysia State Selangor Sek 14, Ecclesiastical status Mosque, Architectural description, Architectural type Mosque, Architectural style Islamic.